Lower eyelid aging results in prominent adipose tissue, skin redundancy, increased rhytids, and laxity. The images below depict a patient who underwent combined upper and lower laser blepharoplasty, perioral and periorbital carbon dioxide laser resurfacing, SMAS facelift, and full-face blue peel. Laser tissue resurfacing. 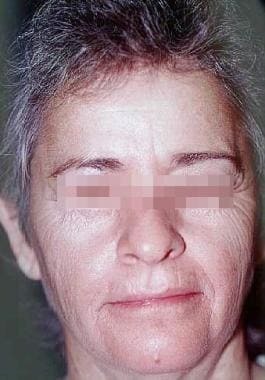 Female patient with skin and muscle laxity, photoaging, and dermatochalasis. 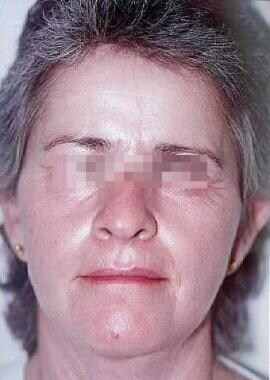 Same patient as in image above underwent combined upper and lower laser blepharoplasty, perioral and periorbital carbon dioxide laser resurfacing, SMAS facelift, and full-face blue peel. This photograph was taken 6 months after the procedure. Depigmentation seen periorbitally, periorally, and on the forehead following carbon dioxide laser resurfacing. Extensive knowledge of skin microanatomy, histology, and physiology is essential before proceeding with resurfacing procedures. 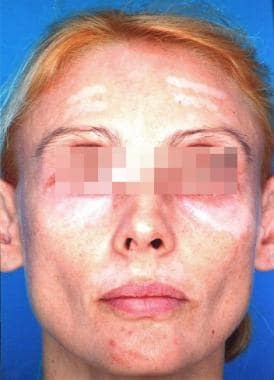 Familiarity with relative facial skin thickness (ie, thin, medium, thick) is necessary to limit overtreatment and potential complications. Carter SR, Seiff SR, Choo PH, Vallabhanath P. Lower eyelid CO(2) laser rejuvenation: a randomized, prospective clinical study. Ophthalmology. 2001 Mar. 108(3):437-41. [Medline]. Griffin RY, Sarici A, Ozkan S. Treatment of the lower eyelid with the CO2 laser: transconjunctival or transcutaneous approach?. Orbit. 2007 Mar. 26(1):23-8. [Medline]. Goldbaum AM, Woog JJ. The CO2 laser in oculoplastic surgery. Surv Ophthalmol. 1997 Nov-Dec. 42(3):255-67. [Medline]. Seckel BR, Kovanda CJ, Cetrulo CL Jr, Passmore AK, Meneses PG, White T. Laser blepharoplasty with transconjunctival orbicularis muscle/septum tightening and periocular skin resurfacing: a safe and advantageous technique. Plast Reconstr Surg. 2000 Oct. 106(5):1127-41; discussion 1142-5. [Medline]. Harris DM, Fried D, Reinisch L, et al. Eyelid resurfacing. Lasers Surg Med. 1999. 25(2):107-22. [Medline]. Alster TS. Cutaneous laser resurfacing: what's hot. Cosmetic Dermatol. 1999 October. 18-23. Felder DS. CO2 laser skin resurfacing in oculoplastic surgery. Curr Opin Ophthalmol. 1996 Oct. 7(5):32-7. [Medline]. Balzani A, Chilgar RM, Nicoli M, Sapountzis S, Lazzeri D, Cervelli V, et al. Novel approach with fractional ultrapulse CO2 laser for the treatment of upper eyelid dermatochalasis and periorbital rejuvenation. Lasers Med Sci. 2013 Nov. 28 (6):1483-7. [Medline]. Brauer JA, Patel U, Hale EK. Laser skin resurfacing, chemical peels, and other cutaneous treatments of the brow and upper lid. Clin Plast Surg. 2013 Jan. 40 (1):91-9. [Medline]. Trelles MA, Rigau J, Mellor TK, Garcia L. A clinical and histological comparison of flashscanning versus pulsed technology in carbon dioxide laser facial skin resurfacing. Dermatol Surg. 1998 Jan. 24(1):43-9. [Medline]. Alster TS, Bellew SG. Improvement of dermatochalasis and periorbital rhytides with a high-energy pulsed CO2 laser: a retrospective study. Dermatol Surg. 2004 Apr. 30(4 Pt 1):483-7; discussion 487. [Medline]. Walgrave SE, Ortiz AE, MacFalls HT, et al. Evaluation of a novel fractional resurfacing device for treatment of acne scarring. Lasers Surg Med. 2009 Feb. 41(2):122-7. [Medline]. Fife DJ, Fitzpatrick RE, Zachary CB. Complications of fractional CO2 laser resurfacing: four cases. Lasers Surg Med. 2009 Mar. 41 (3):179-84. [Medline]. Horton S, Alster TS. Preoperative and postoperative considerations for carbon dioxide laser resurfacing. Cutis. 1999 Dec. 64(6):399-406. [Medline]. Ho C, Nguyen Q, Lowe NJ, Griffin ME, Lask G. Laser resurfacing in pigmented skin. Dermatol Surg. 1995 Dec. 21(12):1035-7. [Medline]. Railan D, Kilmer S. Ablative treatment of photoaging. Dermatol Ther. 2005 May-Jun. 18(3):227-41. [Medline]. Ross EV, Grossman MC, Duke D, Grevelink JM. Long-term results after CO2 laser skin resurfacing: a comparison of scanned and pulsed systems. J Am Acad Dermatol. 1997 Nov. 37(5 Pt 1):709-18. [Medline]. Sullivan SA, Dailey RA. Complications of laser resurfacing and their management. Ophthal Plast Reconstr Surg. 2000 Nov. 16(6):417-26. [Medline]. Carter SR, Stewart JM, Khan J, et al. Infection after blepharoplasty with and without carbon dioxide laser resurfacing. Ophthalmology. 2003 Jul. 110(7):1430-2. [Medline]. Trelles MA, Mordon S, Svaasand LO, Mellor TK, Rigau J, Garcia L. The origin and role of erythema after carbon dioxide laser resurfacing. A clinical and histological study. Dermatol Surg. 1998 Jan. 24(1):25-9. [Medline]. Tan KL, Kurniawati C, Gold MH. Low risk of postinflammatory hyperpigmentation in skin types 4 and 5 after treatment with fractional CO2 laser device. J Drugs Dermatol. 2008 Aug. 7(8):774-7. [Medline]. Avram MM, Tope WD, Yu T, Szachowicz E, Nelson JS. Hypertrophic scarring of the neck following ablative fractional carbon dioxide laser resurfacing. Lasers Surg Med. 2009 Mar 16. 41(3):185-188. [Medline]. [Full Text]. Sandel HD 4th, Perkins SW. CO2 laser resurfacing: still a good treatment. Aesthet Surg J. 2008 Jul-Aug. 28(4):456-62. [Medline]. Fulton JE, Rahimi AD, Helton P, Dahlberg K, Kelly AG. Disappointing results following resurfacing of facial skin with CO2 lasers for prophylaxis of keratoses and cancers. Dermatol Surg. 1999 Sep. 25(9):729-32. [Medline]. Alexiades-Armenakas MR, Dover JS, Arndt KA. The spectrum of laser skin resurfacing: nonablative, fractional, and ablative laser resurfacing. J Am Acad Dermatol. 2008 May. 58(5):719-37; quiz 738-40. [Medline]. Kilmer SL. Laser treatment of tattoos. Dermatol Clin. 1997 Jul. 15(3):409-17. [Medline]. Disclosure: Serve(d) as a speaker or a member of a speakers bureau for: Mimedx.